The design of this sconce recalls the Nineteenth Century, when the owner of the house would come home late at night to find a candle left burning to light the way, and a place to hang special keys. The wood comes from this period and has a history as rich and deep as its six coats of tung oil varnish. 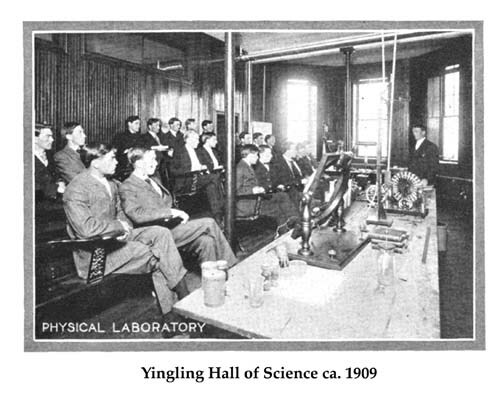 In 1904 Western Maryland College’s Yingling Gymnasium was converted into Yingling Hall of Science. As part of that renovation, long ash benches with maple tablet arms were installed in the tiered Physical Lecture room (see picture). When Yingling was razed in 1913 to make way for Lewis Recitation Hall (dedicated in 1914), those benches were moved to a similar lecture room on the third floor of the new building. For decades, that room (Lewis 314) was used by the Chemistry Department and, from 1973 to 1999, every graduating chemistry major gave their senior seminar in that room. During the 2001 renovation of “Old Lewis,” the old benches were refinished and fitted with new tablet arms. The old tablets, bearing inscriptions carved by generations of students, were discarded. But, Dr. Rick Smith rescued many of them, and your sconce was made from one of those salvaged treasures of Western Maryland Science. Follow the WMC tradition, where the light is always left on, awaiting your return. Note:Western Maryland College was renamed McDaniel College in 2002. These sconces still bear the old name because they were rescued while the College was still WMC.